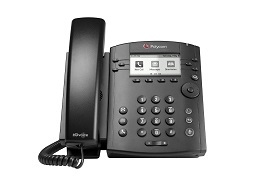 The Polycom VVX300 is a popular 6-line entry level IP phone for small and medium sized businesses. It supports HD voice and has two 10/100 Ethernet ports and can be powered using Power over Ethernet (PoE), though you also have the ability to use a regular power supply. The below provides a summary of our Polycom VVX300 review followed by a description of what is in the box, setup and installation. This particular Polycom model is on the lower end of the price spectrum however, it boasts quite a few neat features for its low price point. Unlike most other phones, this model usually comes with a power supply from most (but not all) suppliers, which is very budget friendly and especially useful if PoE is not an option for your setup. The phone is automatically configured to pull an address from Dynamic Host Configuration Protocol (DHCP) so once it boots, it should be connected to your network. Checking the network information in the settings menu allows you to easily find the IP address to plugin to a browser and begin what should be a very short configuration process. Configuring the phone from a browser is quite simple for most setups. The phone hardware and software is surprisingly fast so accessing various configuration areas is quick. Each configurable item allows you to hover over the field and read an explanation appearing on the right side of the page. This is helpful for those new to VoIP equipment, when configuring a device manually. Many phones do not have decent description fields, so this was a pleasant surprise. Users (or admins) have a variety of ways to configure the device to function with any given system. The easiest of which is auto-provisioning, if supported by your IP PBX or hosted provider. Even if inputting manual settings, this can be easily accomplished by visiting the Simple Setup link on the top bar of the web configuration and plugging in the required information. After successfully registering the device, calling is a simple process, as you would expect from any modern device. The actual handset design is simple and high quality - much the same as any other Polycom phone. The audio quality seems to be very good, again something that Polycom prides itself on. The base features 6 programmable keys to be used for a variety of functions such as switching between lines or speed dial. Soft keys linked to buttons just below the screen may also be programmed for different functions, such as transferring a call, DND (Do Not Disturb), hold and more. Another great function is the ability to access data like contacts and calendar information from a Microsoft Exchange server when configured to do so. Surprisingly, there is no quick start guide shipped with this phone. This is unusual as these days most phone manufacturers pack a basic quick start guide with their phones. However, if you have a little knowledge using IP phones, it is unlikely you will need any help. Inexpensive (around $100), entry-level phone with virtually every standard phone feature and more. Device can connect to a Microsoft Exchange Server for quick access to contacts and calendar. The base features 6 programmable buttons for speed dial or swapping lines. Context sensitive soft keys can be modified in the web administration console to improve user experience. Considering the device is designed and sold as an entry-level device, it is remarkably good and having 6 lines is unusual for entry level IP phones. Compared to some other options on the market, some of the additional features make it stand out above some of the competitor models and even similar Polycom models. Even if not using some of the "bonus" features like Exchange connectivity or presence features, the price of the phone is on par with other lower cost IP phones, so it is a great choice for companies looking for cost effective communication devices. The fact that many resellers offer the device with a power supply is very helpful if purchasing several devices on a tight budget. Polycom VVX 300 base, handset and connecting cable. Phone stand with various mounting points to adjust angle. Desk-lock to secure the phone in position. After opening the box and removing all of the packaging, I was a little surprised by the lack of a quick start guide found with most other IP phones. Fortunately, nothing is too complicated - it should very apparent which port is used for each cord provided, thanks to inscriptions above each port. The stand was confusing for a moment, but like Lego, it really can only connect one way. I used my own IP PBX to test this device. I simply used my everyday extension information to plug into the device and the phone registered shortly afterwards. I chose to connect manually rather than use the auto-provision feature. After connecting the device to a switch, it booted in about one minute. By pressing the Home button (it resembles a house) and scrolling to the Settings option, I was able to scroll down and find the network settings I needed to configure it from an Internet browser. Type the IP address of the phone into your web browser (I used Google Chrome) and enter "456" to login with administrative privileges. The second of the six items in the top menu bar is Simple Setup - click here to manually input the registration settings for the device. Language: Choose the language of the user - the default is English so if you are reading this without translation, it does not need to be changed. Time Synchronization: Several popular time servers are available from the drop down menu. Pick the one that represents your time zone. SIP Server: Enter the FQDN (Fully Qualified Domain Name) for your PBX server and the phone will use it to register and route calls. If using something other than the default 5060 for SIP traffic, change this value. SIP Outbound Proxy: If your system uses a proxy, enter the server information here. Otherwise, leave the fields alone. SIP Line Identification: Enter the display name you would like internal callers to see when you dial their extension. 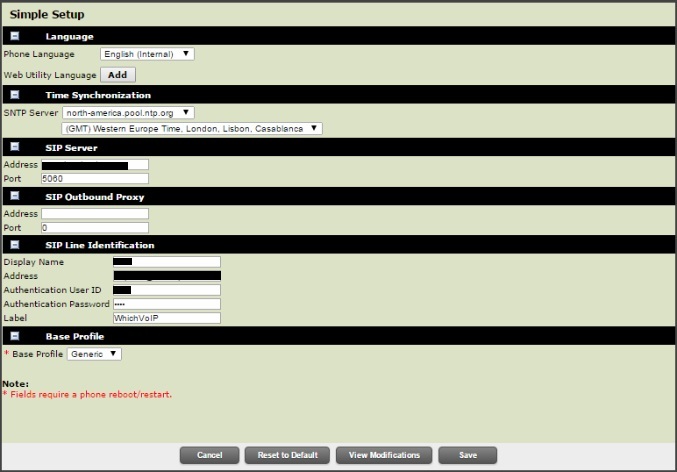 Address will be the registration string used to register with your provider (e.g. username@your.sipserver.com.) If your system requires an additional authentication user enter the value otherwise, leave it blank. Enter the password and something for the label that will appear on the device display. Base Profile: Leave this as Generic. After saving the settings, the phone should show it as registered, indicated by a "phone/checkmark" icon on the main screen. Calls should be possible at this point however, a few other settings may need tweaked. In my case, I only allow a few different audio codecs to be used by phones connecting to my PBX. 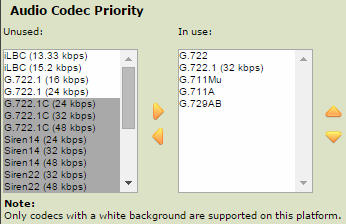 A few of the default Codecs not used by my system are given high priority which can affect service. Under the Preferences item on the top menu, you will find Audio Codecs from the drop down menu. Move the codecs used by your system or service into the "In use" field (see Figure 2) and click the Save button at the bottom of the page. You are now done configuring the phone and it should be up and running as part of your telephone network. If you want to learn more on configuring the device to meet your needs, check out the "Info" tab above which has useful links for the Polycom VVX300. Polycom VVX300 reviews are listed in chronological order. The sound quality for this phone is very good. Also like that for a low price I have access to 6 sip lines.